This head-turning car produces 621bhp and is heading to a dealership near you. 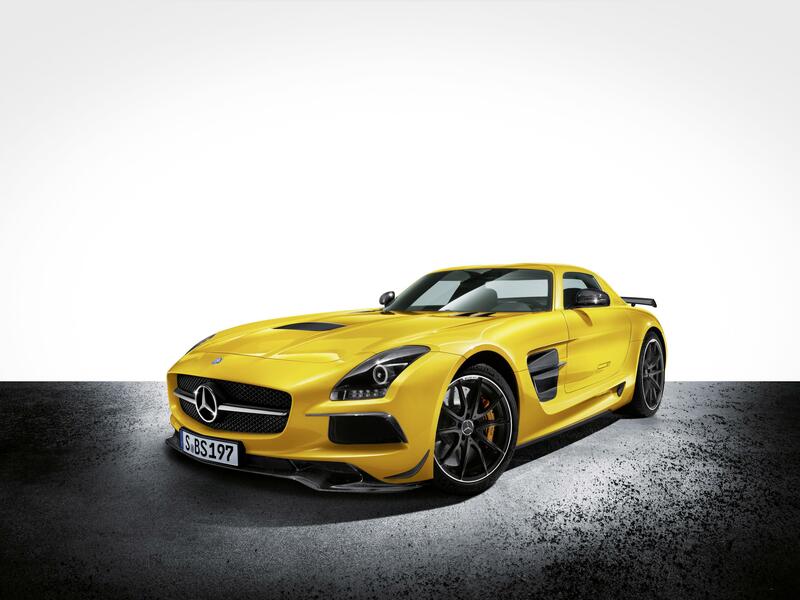 But with a top speed of 196mph, buyers of the SLS AMG Black Series won’t get many opportunities of testing the engine to its fullest capabilities. AMG, which is Mercedes’ in-house tuning team, have been inspired by the performance from the firm’s SLS GT3 race car. And then they’ve made it better for the roads! The hand-built 6.2litre V8 engine has been increased from 563bhp and the rev limit from 7,200 to 8,000rpm. They’ve also added a gas filled strut to help brace the engine when the driver decides to change direction quickly. There’s also a fully revised high-speed valve train with modified camshafts, adapted cam geometry and optimised bucket tappets featuring a special coating which is otherwise exclusive to racing vehicles. The SLS AMG Black Series will hit 0-62mph in just 3.6 seconds. The Black Series – a name that resonates with petrolheads everywhere – follows on from the SLK 55 AMG Black Series from 2006, the CLK 63 AMG Black Series (2007), the SL 65 AMG Black Series (2008) and the C 63 AMG Coupé Black Series (2011). This, the fifth exponent, sees the Black Series entering a new dimension with the impressive gull-wing model. There’s no indication of prices yet but it’s probably wise to say that the SLS AMG Black Series will be cheaper to lease rather than buying one! This entry was posted in News and Views and tagged 2008, AMG, Black Series, caption, car, CLK, LS, LV, mercedes, price, SL, SLK, sls amg, sls amg black series, speed by Steve Lumley. Bookmark the permalink.